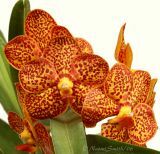 Orchids are one of the largest families of flowering plants and also one of the most highly evolved. With the exception of the desert they are found in most regions around the world. Estimates suggest as many as 25,000-30,000 species currently in existence. For larger images please click on pictures. Beautiful collection.There are some that I have not seen before. Used to have about a hundred (or so)in the kitchen(I never cooked). I just bought two new orchids for my appartment at Orchidofolie in University Laval in Québec city, an Odontoglossum alliance Pink Lady and an Oncidium Sharry baby...those are smelling so fantastic(I have two other Phalaenopsis who bloom regularly).